This tutorial demonstrates how to use a Web Page as an Embedded Folder Page	in the Decisions Portal	. This feature is introduced in Decisions 4.0 . With this functionality we can create a Folder View in Decisions using any accessible web page. In this example we are going to create a Folder Page that will display Decisions Documentation	website. In Decisions Portal	we click Manage > Page > Add Embedded Web Page	from the Folder Actions. In Add Embedded Web Page	window we set our Page Data. First, we provide our Page with Page Name	. Then, we define Url	to the Web Page that we want to display. Order	setting sets up the order for this Page on the top Folder Panel (zero indexed) . Next, we checkIs Relative To URL	check-box. 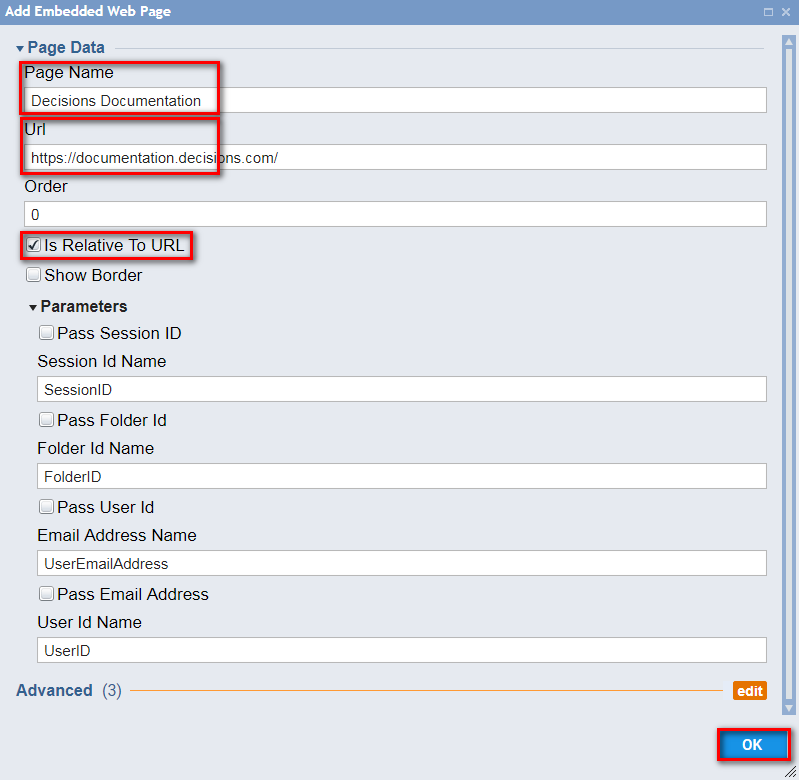 We can also pass some Parameters	like: Session ID, Folder Id, User Id, Email Address . When finished, we click Ok	to save our Page and continue. Our Page is attached to Folder Views. We click it and Decisions Portal displays our web page embedded into the Folder Page.